I'm handing out candy tonight, folks, so no entry. There's no NHL hockey on tonight anyway, so enjoy the night off like the NHL players and staff are. I'm hoping to see some great costumes tonight, but it's raining in my neck of the woods so I'm not sure I'll see many kids out with malls handing out candy and it being far drier inside. In any case, have fun tonight if you head out to get a haul of candy. Make sure you get your parents to check everything before diving into your haul, but enjoy the sugar rush! Starting today, The Rundown will focus only on the Canada West Conference of the CIS. I'll be honest in saying that being busy is forcing my hand in this one, but I simply don't have enough time to watch highlights, videos, and live games all weekend from the other CIS conferences. That's not to say that I won't talk about them when necessary, but recapping some 35 games each week has proven taxing both on me and my busy schedule. Instead, I'll focus on the eight games each week that matter most to me. If someone out there wants to contribute recaps for the OUA, RSEQ, or AUS, I'll gladly accept them. Without further adieu, however, let's get to the action! LETHBRIDGE at CALGARY: After a scoreless first period, these two teams got into the scoring action. Lethbridge's Mackenzie Gal showed off her hands as she went shelf over Kelsey Roberts from in tight, and the Pronghorns had a 1-0 at 8:54 of the middle frame. 1:37 later, Heather Berzins redirected a nice pass from Cheyann Newman past Alicia Anderson while on the power-play, and the Dinos evened the score at 1-1. The Dinos would take the lead at 16:11 when Chelsea Court went short-side on Anderson after a nice passing play with Sasha Vafina, but Lethbridge would find their own equalizer 51 seconds later while on the power-play as Jenae Culp snapped a shot that Roberts couldn't stop. After 40 minutes, the Pronghorns and Dinos were tied at 2-2. It appeared that this game would go to Lethbridge when the Pronghorns got a goal at 17:35 when Brett Campbell ripped a shot past Roberts while on the power-play. However, Calgary's Sasha Vafina wouldn't let the Pronghorns escape just yet as she broke in on Anderson and went bar-down just 33 seconds after Lethbridge had taken the lead. With the two teams tied at 3-3, we'd need extra time! The 4-on-4 overtime solved nothing, and the 3-on-3 overtime still saw the game knotted up. We'd move to the skills competition where both Lethbridge and Calgary couldn't solve the netminders through four rounds. Sarah Spence, sent out for a second shot in the fifth round, managed to snipe a goal on Kelsey Roberts. Chelsea Court wasn't able to score on Anderson, and the Lethbridge Pronghorns earned a 4-3 shootout victory over the Calgary Dinos. Alicia Anderson made 40 saves in the victory while Kelsey Roberts stopped 38 shots in the loss. CALGARY at LETHBRIDGE: The second-half of the home-and-home between these two Alberta teams saw the Pronghorns grab a lead at the 9:59 mark after some very cautious play to open the game. Katelyn Breitkreuz was in the right place to collect a rebound and her shot caught a piece of Hayley Dowling, but the puck still found the back of the net for the 1-0 lead. Penalties would highlight the second period's action, but there would be a goal at 9:27. Mackenzie Gal scored her second goal of the weekend as she skated into the face-off circle from the half wall and wired a shot past Dowling for a 2-0 Pronghorns lead. Despite the penalties, neither team's power-play could capitalize, so we'd head to the third period with Lethbridge ahead by a pair of goals. Calgary started the third period on the power-play, but would score four seconds after the penalty expired. Paige Michalenko's shot for the point made it through the traffic in front of Alicia Anderson and under the netminder at the 1:00 mark to make it a 2-1 game. Despite a number of chances and a furious scramble at the end of the game with Dowling on the bench, Calgary couldn't get anything else past Anderson as she held the 2-1 score for the Pronghorns through to the final buzzer. Anderson was good on 30 of 31 shot she faced while Dowling made 25 of 27 stops in the loss. #10 ALBERTA at MOUNT ROYAL: The other all-Alberta match-up this weekend featured the Cougars and Pandas, and it would be Mount Royal who jumped out to a lead. Just 3:19 in, Sarah Weninger ripped a shot past Lindsey Post on an early power-play to make it 1-0 for the Cougars. However, the Pandas came right back as Amy Boucher converted a Kennedy Ganser pass past Emma Pincott at 5:59, and we were knotted up at 1-1. We jump to the second period where Ganser was the recipient of a Boucher pass, and she fired a shot past Pincott to put the Pandas up 2-1 at the 5:14 mark. The Pandas would continue some good pressure, and Hannah Olenyk would take advantage as she sniped a goal at 8:40 to give the Pandas a two-goal lead. Post continued her solid play between the pipes, and Alberta took the 3-1 lead into the second intermission. Normally, this would be a quiet third period as the Pandas would shut it down, but the Cougars refused to go quietly. Channia Alexander found some room past Post at 10:12 to make it a 3-2 game, and Cougars seemed to come to life. With pressure in the offensive zone, the Cougars drew a penalty as Ashley Morin was whistled for body-checking. On the ensuing power-play, Shawni Rodeback fired a point shot that got past the screen and Post at 16:28 to make it a 3-3 game! And with that goal, this game would need extra time to determine a winner! Overtime would solve nothing between these two teams, so they would move to the skills competition. Nothing would happen in the first three rounds, but Mount Royal would notch the first goal as Rachel Piitz faked a deke and fired home a shot on Post. Kennedy Ganser, who was having an outstanding game, needed to score, and she would beat Pincott with a move to even the shootout. Another two rounds would go by without goals before Reanna Arnold was stopped by Post. Guess who, on her second shot of the shootout, would end this game? Ganser didn't even fake the deke as she sniped a shot past Pincott to give Alberta the 4-3 shootout win! Post made 20 saves in the win while Pincott stopped 27 shots in the loss. MOUNT ROYAL at #10 ALBERTA: It was off to Edmonton for the second-half of the home-and-home weekend. I'm not sure if it was the game the previous night or the travel, but neither team seemed to have much jump in their legs. No goals were scored in the first or second periods despite Alberta leading 14-6 in shots. The third period offered more opportunities as both teams perhaps sensed that a single goal might be the difference, and it indeed would be. With 2:06 to play, Gabrielle Seper's wrist shot was deflected by a Pandas defender, and the ricochet found its way past Dayna Owen in the Pandas' net for the 1-0 Mount Royal lead. Zoe DeBeauville wouldn't allow anything past her despite some fierce pressure from the Pandas, but the Cougars would hold on for the 1-0 victory! DeBeauville stopped all 26 shots for the shutout win while Dayna Owen took the loss while making just 13 saves. This was a fairly historic win for the Mount Royal Cougars. It's the first time in 22 meetings that they have defeated the Pandas, and the first time in 16 meetings in Canada West play that they recorded a win versus the Pandas. And, according to their publication on this game, Seper's third-period tally was the first goal scored by a Cougar at Clare Drake Arena since January 5th, 2013 - a span of almost 14 consecutive games. Wowzers! REGINA at #9 SASKATCHEWAN: The battle of Saskatchewan kicked off in Saskatoon on Friday night. However, it was the Regina squad who came out guns a-blazing. Kyle Kupper scored a power-play goal 3:10 into the game, and Jaycee Magwood added a second Cougars goal 2:20 later to put Regina up 2-0. Saskatchewan woke up after the early deficit was established and began playing some good shutdown hockey, but Jane Kish was equal to the task as she turned away all attempts. When all was said and done after 60 minutes, the 2-0 lead was still intact and the Regina Cougars recorded the win. Kish stopped 28 shots for the shutout win while Cassidy Hendricks took the loss in allowing two goals on 20 shots. #9 SASKATCHEWAN at REGINA: The third series to feature a home-and-home moved to Regina on Saturday. Both teams played a cautious first period with no scoring, but the deadlock would be broken in the middle frame. Regina's Kylie Gavelin sacrificed her body to block one shot and used her stick to deflect another, but the bounce would land on the stick of Saskatchewan's Courtney Cormack who beat Morgan Baker to open the scoring at 14:18. Regina would find the equalizer 1:58 into the third period. Melissa Zerr took a long outlet pass from Krista Metz and used her speed to split the Huskies defence before going high on the short side on Cassidy Hendricks to make it 1-1. With Saskatchewan's Lauren Zary in the sin bin, Jaycee Magwood made it a 2-1 game on the power-play when she took a pass from Gavelin, stepped into the slot, and put a backhanded shot over Hendricks' glove at 14:39. Magwood would add a second goal into an empty net at 19:10, and the Regina Cougars skated to the 3-1 victory. Morgan Baker made 16 saves for the win while Hendricks took her second-straight loss while making 35 saves. #7 MANITOBA at #1 UBC: In a battle of the Canada West powerhouses, the two CWUAA finalists from last season would meet in Vancouver. Mathea Fischer put the top-ranked CIS club out in front when she deflected a shot past Rachel Dyck at 14:32, but Manitoba would let that lead stand for all of 22 seconds. Sheridan Oswald was credited with the goal as the bouncing puck handcuffed Amelia Boughn, and we were knotted up at 1-1. It was once again a deflection in the second period that put the Thunderbirds ahead. At 12:28 and with the man-advantage, UBC's Stephanie Schaupmeyer deflected a shot from Cassandra Vilgrain that eluded Dyck, and UBC had the 2-1 lead. But 1:24 later, Manitoba squared the game. Charity Price cleaned up a rebound of an Alexandra Anderson shot that Boughn couldn't corral, and it was a 2-2 game. The third period was a tight-checking affair, but UBC began to put more pressure on the Bisons as they rolled lines with the last change. With 2:04 to play, Hannah Clayton-Carroll's wrist shot past a partially-screened Dyck would be the winner as she put UBC up 3-2. With Dyck on the bench, Manitoba pressured for the tying goal, but Boughn shut the door for the win. Boughn would make 16 saves in the victory while Dyck turned aside 25 shots in the loss. #7 MANITOBA at #1 UBC: The rematch went Saturday afternoon, and it was a completely different game. Manitoba was called for 11 minor penalties in this game, and UBC converted three power-play opportunities. Stephanie Schaupmeyer opened the scoring at 1:50 of the first period as the only goal of the opening frame. However, in the second period, Kathleen Cahoon added a goal at 6:21 and Hannah Clayton-Carroll scored at 8:28 which would end Rachel Dyck's afternoon. Amanda Schubert relieved Dyck, and she fared no better. Alexa Ranahan scored a power-play goal at 11:19 to put UBC up 4-0 as the top-ranked team in the nation flexed their muscles. Erin Kucheravy would beat Tori Micklash at 15:48, but you could see the wind had already been taken out of Manitoba's sails by the end of the second period. Haneet Parhar would add a second power-play goal for UBC at 1:26 of the third period. Manitoba's Cassandra Taylor would cut the deficit with her goal at 6:24, but UBC would add their third power-play goal of the afternoon when Mairead Bast beat Schubert for the 6-2 lead. That would be all that Micklash needed as the UBC Thunderbirds down the Manitoba Bisons in two-straight games by that 6-2 count. Micklash stopped 16 shots for the win while Rachel Dyck took her second loss in allowing three goals on 18 shots. Schubert made 11 saves on 14 shots in her relief appearance. It should be noted that next week is the final week of games before the CWUAA break for Remembrance Day. The women will take the week off in memory of those who bravely sacrificed their lives for us. With no games scheduled, the standings will be a birds-eye view into how this conference may shake out by the end of the season. There's no doubt that the UBC Thunderbirds are playing some inspired hockey right now as the top women's team in the CIS/USports standings. Manitoba should remain in the top-ten despite the pair of losses, but I'd be shocked if Alberta and Saskatchewan remain in the top-ten. Saskatchewan was out-played by Regina entirely while Alberta showed their youth in earning just two points against the Mount Royal Cougars. We'll see how everything shakes out this week! Tonight, thanks to some short-staffedness on behalf of the men's hockey crew, I was tasked with the opportunity to be the public address announcer at the Manitoba Bisons men's hockey game. While we don't have an NHL-sized crew to work the timekeeper's box and everything else that happens on the other side of the rink away from the confines of the broadcast booth I'm usually in, I got a crash course on what the guys above do on a nightly basis. Needless to say, I have a whole new set of respect for the men who announce everything happening inside the arena. Let me start by saying that Tom H.'s job with the Bisons is entirely safe when it comes to the public address announcing. I'm sure with more practice I could get into the swing of things, but my one-night cameo in the timekeeper's box was an eye-opener. A big thanks goes out to Mike W. whose information and knowledge of what I was to be doing went a heckuva long way. As much as I am comfortable with names, I found it's the little things that Tom does that perhaps very notice when it comes to his job downstairs. In saying that, I'll give you a bird's eye view into what happens on the other side of the rink. I arrived early enough to get myself into the timekeeper's box with Mike who gave me the Coles Notes version of what I would be doing. There was a prepared script I was to follow, there were lineups with pronunciations for me, and there was some basic timing cues. In other words, I was pretty much setup by the staff to do the job, but one question remained: could I? If there was one thing I'd change, it would be to get in earlier before fans start arriving and doing some audio tests. I am used to speaking on a microphone with the radio show, and there's certain nuances that go with that - how far away from the microphone do you have to be, how loud does one have to project, enunciations based on the distance away from the microphone and projection of one's voice, et cetera. I did get some feedback from the press box at the first intermission, though, and that was helpful even though they said I was mumbling. I wasn't. I just wasn't projecting! I will admit that I stumbled on a couple of names, but this might be alright considering the names. The first was "Anishinaabeg", an Aboriginal word that is the collective form of the Ojibway, Odawa and Algonkin Peoples who use and share the Algonquian languages. The University of Manitoba recognizes the Aboriginal lands that the university was founded on with an announcement prior to the national anthem at every game as a sign of respect for those Aboriginal Peoples and their lands. The word does require some practice to say, and I stumbled on the pronunciation slightly. The correct pronunciation is "ah-NISH-ah-NAH-beg", and I stumbled on the "ah-NAH" part. Sorry, Anishinaabeg Peoples. No disrespect meant from this rather naïve white kid. The other name that threw me a little despite me knowing the pronunciation? UBC's Wes Vannieuwenhuizen. 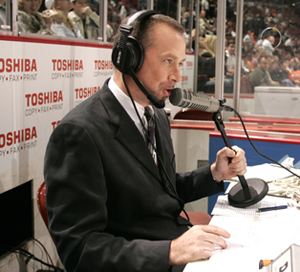 The sad part is I know how to say it - "Wes Van New-en Hyoo-zen" - and it has never caused me an issue when calling men's hockey games before. In fact, I repeatedly had to say the name for another broadcaster last season who liked to marble-mouth his name, but never once got it right until a few minutes remained in the third period. Tonight? I took one look at the pronunciation guide, and it completely messed with my brain. Needless to say, I didn't look at the pronunciation guide again when Vannieuwenhuizen visited us in the penalty box for a second time. Overall, I would say that I had a good time from the second period on once I got the projection of my voice down and the pronunciations right. Annoucements went off without a hitch, Mike and I got our timing down between music and announcements, and we worked pretty seamless second and third periods. Communication is the key in the timekeeper's box, and Mike and I made good use of our communication skills both in auditory sounds and body language. By the time the third period hit, we were engaged in full conversations while taking short breaks to do our jobs! I have a new respect for the public address announcers. I always did respect them for what they do and the obvious public embarrassment of making a mistake, but to get to do a job like the public address announcer is pretty cool in my books. I don't know if I'll be asked back by the Bisons men's hockey team - they lost 3-2 - but I'll be ready if they ever need me again! In what will be one of the few pictures we'll see of her, the goaltender to the left in the Peoria Rivermen colours is none other than Shannon Szabados. 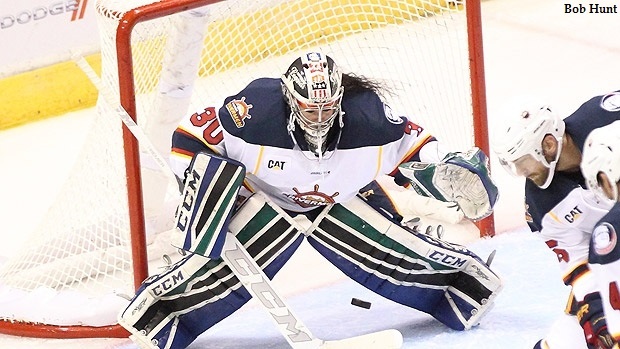 You may remember that Szabados signed with the SPHL's Rivermen after playing with the rival Columbus Cottonmouths for the last couple of seasons in the same league. She posted respectable numbers for the last-place Cottonmouths last season, and her arrival to the defending SPHL champions this season was met with some fanfare. However, after a pair of games in which the Rivermen were blown out and looked lost on both nights, Szabados and two other players were shown the door by head coach Jean-Guy Trudel. Today, he seemed to vent his frustrations to the media via a CBC article. The article, written by Doug Harrison, features Trudel speaking emotionally and without a lot of thought at times, but he reveals some rather interesting tidbits of information about the team, its management, Szabados' agent, and the coach himself. Before we go on, though, if you haven't been following Szabados' story through her professional hockey career withy the men, she has maintained that she is just like any other goaltender and should not be treated differently just because she's a woman. She despises the notion that she's a sideshow or some sort of ticket-selling feature for teams, and has really worked hard at her craft to be taken seriously in the men's game. Again, she posted respectable numbers on the ninth-place team in a nine-team league where eight teams make the playoffs. Szabados relieved Phaneuf in the second period after Phaneuf was given the hook by Trudel in the opening game. The Rivermen would drop the season opener 6-1 on October 21. Szabados, for the record, allowed two goals on 15 shots to the Huntsville Havoc. The following night, Szabados was pulled from her first Peoria start after giving up a pair of Huntsville goals in the first 4:05 of the second period to put the Rivermen down 3-1. Huntsville went on to win 5-1 in that game. Highlights for both games are below, so you be the judge on how Szabados performed. Yeah, I'm not sure she could have stopped either of those two goals. One of a player standing at the back post and another that was wired in off the post? Those are the same types of goals that NHL veterans give up. The back post goal is entirely a defensive problem as opposed to a goaltending problem while the second goal is just a good shot, and good shots sometimes go in. It's that simple. Ok, those last two goals are ones that I'm sure Szabados wants back, but I'm not sure that cutting her from the team is the appropriate response to a couple of bad goals. If we're going to be honest, the Havoc simply out-skated, outworked, and out-played the Rivermen in all facets of the games this past weekend, and made the reigning SPHL coach of the year in Trudel look bad in the first two games of his team's title defence. And what happens when coaches are embarrassed? A team shake-up is almost always the card that is played. What struck me as odd, however, is that Trudel basically admitted that he never wanted Szabados from the start. Mr. Harrison writes, "Jean-Guy Trudel told CBC Sports that he only signed the 30-year-old as a 'package deal' in order to get defenceman Carl Nielsen, a friend of Szabados" - a damning statement from a guy who is supposed to be the best coach in the SPHL. It's shocking to read that since you wouldn't expect a pro hockey team to have much trouble trying to bring in a defenceman. Neilsen, in his defence, hasn't shown any sort of high-level talent to get him above the ECHL level in his career, but he has had a couple of solid seasons with the Florida Everblades and Orlando Solar Bears where he posted seven goals, 14 assists, and 202 penalty minutes. He was also named to the ECHL All-Star Team in 2014-15. "I tried to do something to get this great defenceman that plays 25 minutes a game, and it didn't work out," Trudel told CBC Sports. The problem with that statement, however, is that Nielsen barely played last season. In their own press release, the Peoria Rivermen stated, "Nielsen, 28, comes to the Rivermen after he ended a preseason retirement last year to play 13 games for ECHL Orlando, where he was named a team captain." 13 games at 25 minutes a night? Sure, that's a nice total for a veteran player, but it's not like he's the Ryan Suter of the ECHL. He only played in 13 games! Making matters worse for Trudel in his statement was his admitting that Szabados "was fourth on the depth chart after camp." Even minor-hockey coaches know that the fourth-stringer is probably never going to see the ice, but in pro hockey that's a death knell as a contract won't be extended and practice time on the ice won't be granted. Yet in one of the most inexplicable moves, Trudel kept Szabados in order to keep Nielsen! Perhaps he shouldn't have been named coach of the year after he had a major part in creating this debacle? What coach keeps a fourth-string goalie as the backup to the starter, and then cuts them both? And why is he so hung up on Nielsen as a defenceman when there are other players who would fill the void just as well? "It's the first time I've dealt with a package deal and I won't deal with it again. I think it's wrong for the game of hockey. Maybe I'm old-school but I like to coach players who deserve to be here." Trudel said the Szabados-Nielsen deal is the "most different situation" he's been involved with in all his years coaching and 13 seasons playing mostly at the minor pro level. "I'm paid to make sure my ownership is happy, that we win a lot of games, so I gotta do what I gotta do to make sure my team is in a good state of mind to win hockey games." Trudel indicated that he tried to broker a deal with Nielsen to keep the veteran player in Peoria, but the defenceman ultimately stood beside Szabados and left the team as well. I have never heard of a "two-fer" signing deal before where a coach wants one player, but has to take a second player as well. According to reports, Nielsen and Szabados had forged a strong friendship since meeting at a hockey camp in Denver this past off-season. They expressed their wish to play together this season, and Szabados' agent Russ King worked with Trudel to make the deal happen. Now, I've seen situations where two teammates will try to sign with the same team. Kariya and Selanne did it with the Colorado Avalanche. The NBA saw it done with Lebron James, Chris Bosh, and Dwyane Wade in Miami. However, it wasn't like the Avalanche pursued Kariya to come and play only to be told by Kariya's agent that they had to sign Selanne as well. Each negotiated his own deal with the Avalanche through his own agent, and the two signed to play together on their own terms. It wasn't a "two-fer" deal by one agent. "At our end-of-the-year meeting, I wanted to make sure everybody was on the same page," Bechard said. "I told her that nobody on my team has a job for next season. "Everybody will be vying for a position, and you're one of those. I don't want to block you from playing somewhere else. She told me she was not 100 percent sure whether or not she would play in the next Olympics (in 2018), but she definitely wanted to play another year." "She e-mailed and said it would be best if I didn't protect her. She wanted to see what's out there," Bechard said. In other words, she probably would have had a better shot in Columbus than she ever would have received in Peoria thanks to her history with Bechard and the Cottonmouths. You can't fault Szabados for wanting to explore her options, but sometimes the grass isn't greener. Would she be playing for the Cottonmouths now? It's hard to say, but she would have been given a fairer shake there than what she got from Trudel and the Rivermen. "They were always together and it became kind of weird," said Trudel of Szabados and Nielsen, a native of Lorain, Ohio. "Seeing the [other] players in the locker room, I just saw the situation being heavy on everyone. It was cancerous toward the team. I coach 18 players here so I need to make 18 players happy, not just two." Storm Phaneuf, the other goaltender cut by Trudel in his three-man ousting, told CBC's Doug Harrison in a separate article that what Trudel saw was not what he saw. "Shannon is very nice. She talks to everybody and is friendly to everyone," Phaneuf, 20, told CBC Sports on Friday, four days after Trudel released the goalies following a pair of weekend losses to open the season, and placed the 28-year-old Nielsen on indefinite suspension to retain his SPHL rights. "Shannon is not the kind of girl who would make a situation awkward. In the [dressing] room she was a leader, talking loud and giving tips to the other guys." This sounds more like Trudel was justifying the reasons for cutting Szabados than it was truth. While the other netminder may have seen it one way, perhaps there were players who approached Trudel about the Nielsen-Szabados friendship and how close the two are. If you're not aware, Shannon Szabados is happily married, so let's put this rumour and innuendo to rest right here and now. Storm Phaneuf stated, "It's not like they were holding hands or kissing each other, not at all. They seemed like good buddies. Cancerous is a very big word. I've seen way more cancerous situations [elsewhere in hockey]." In essence, this entire debacle in Peoria is about honesty. Jean-Guy Trudel signed a deal that should have never agreed to in good faith, and Russ King, Szabados' agent, should have known better than to force this upon Trudel who had an interest in Nielsen, but not Szabados. Both men had to see the problems in making a deal like this, especially Trudel who already had three goalies in camp, yet neither man had the decency and honesty to level with one another or the players about what Trudel and the Rivermen needed. King is especially at fault in that he didn't do what his client pays him for, and that's to provide sound, intelligent advice regarding a player's career. Nielsen and Szabados should have been honest with each other when it comes to their individual careers and career paths when it came to putting this deal together. While I get that they wanted to play together, neither are currently in hockey right now because of this wish. Trudel wanted to keep Nielsen on the team, but Nielsen walked out with Szabados and is now suspended indefinitely by the Rivermen meaning he is unable to sign anywhere else in the SPHL this season. Szabados should have encouraged him to stay - and she may have done that - but she shouldn't have let him walk out on the Rivermen only to be stuck in SPHL purgatory. I'd be surprised if Nielsen plays anywhere this season at this point. Finally, Shannon Szabados became the one thing she never wanted to be. She has always wanted to be judged for her abilities and her skill, but by getting her agent to put this deal together she became the one thing she never wanted to be: the sideshow. Trudel never approached King or Szabados about a contract in the off-season, but her desire to play alongside her friend put her in a situation where she was expendable the moment that Trudel accepted the deal proposed by King. She is incredibly talented and deserves an SPHL contract based on those talents, but she can't just demand a team sign her because she wants to play alongside a friend. By doing this, she undermines everything that she's worked for in breaking barriers and earning her spot in the SPHL. Instead, she became a distraction for Trudel who never wanted her on the ice for the Rivermen in the first place, and he discarded her like a fourth-string goaltender would have been. She needed to be honest with herself when it came to this contract in that Trudel never wanted her in Peoria. Do I think Szabados' playing days in the SPHL are over? No, not by a long shot. I think she took some bad advice from an agent who wanted to get her another shot, but I'm guessing she's smarter after this experience now. Will she play again this season? Based on her stats from Columbus where Jerome Bechard admitted "[s]he took a beating" thanks to the personnel in front of her, I'd say she has a good chance of catching on with another team, maybe even returning to the Cottonmouths this season. Evansville, Roanoke, and Pensacola have all given up a pile of goals in their four games, and all three might be considering a chance in the blue paint. This Peoria situation doesn't look good for any of the parties involved, but I think Shannon did the right thing in taking the high road with her comments. 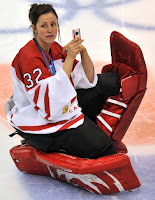 The story's already out there and I don't want to fuel the fire," Szabados told CBC Sports on Thursday. "My focus is signing with a new team. There's a lot more to [the Peoria release] and misleading information but I don't want to put [Trudel] in a bad spot, or the team. "I don't know why he said some of those things," Szabados said, noting she had a good player-coach relationship with Trudel. "It was a very strange situation." That's a classy response from someone who just got railroaded when it comes to her performance and season. Shannon shouldn't be too worried about missing a few weeks as I have a feeling she'll be back soon. There's going to be an SPHL team out there who needs to upgrade their goaltending, and Shannon Szabados will make a triumphant return to the SPHL. She just needs to remain objective about her career options going forward. When it comes to looking our for number-one, Shannon needs to look out for #30 and only #30. The Hockey Show, Canada's only campus-produced hockey radio show, is back with another live show tonight as we broadcast from The Hub Social Club on the UofM campus! Live shows are always so much fun as we can discuss all sorts of crazy stuff and get immediate crowd reaction from those in the lounge. It also gives us a chance to promote some of the great food and beverage specials that The Hub has available all night as The Hockey Show will be followed by the Stars-Jets game on the majority of the TVs! Come on down to The Hub Social Club tonight for some hockey talk and the Jets game! Much to the delight of TJ, we will discuss the NHL's first-overall team in the 6-1-0 Edmonton Oilers. 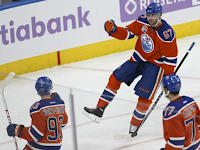 The Oilers are getting key contributions from all over the ice - notably seen in Winnipeg during the Heritage Classic - that have pushed them atop the standings ahead of the Montreal Canadiens who are the only team not to lose in regulation time. We'll also discuss the Heritage Classic and the hoopla surrounding that event, the Jets and their grueling schedule over the next 33 days, Jacob Trouba and his continued holdout, the Manitoba Bisons and their games against UBC this weekend, an update from the Metal Ligaen and Brandon Reid's Aalborg Pirates, and we'll announce the Pledge-O-Rama draw winners! All of this and possibly more tonight on The Hockey Show live from The Hub Social Club! If you're a proud owner of an iPad, iPod, or iPhone AND want to listen to The Hockey Show, you can easily listen to the show by downloading the UMFM app! Just follow this link on your iDevice and get the UMFM app! It's never been easier to tune into The Hockey Show! If you're an Android user, we've had the app out for a few weeks already so you should already have it on your phone or tablet. You do have it, right? What do you mean you don't have it? Why not? Look, get yourself on the right path by following this link and getting the Android app so you can listen too! It's a live show with good friends, good food, and good drinks at The Hub Social Club! Come on down and see the show live at 5:30pm CT! If you can't make it, download the app and listen or tune into 101.5 UMFM where TJ, Beans, and Teebz will chat Oilers, Jets, Heritage Classic, schedules, holdouts, and more on The Hockey Show only on 101.5 UMFM and on the UMFM app! If there has been one women's hockey player that I have admired more than any other for as long as I can remember, Charlene Labonté would be her. I first took notice of the Canadian netminder when the story broke about her playing in the QMJHL with the Acadie-Bathurst Titan because that was somewhat unheard of at that time as only Manon Rheaume had done it previously. Because we're approximately the same age, Labonté was the next Manon Rheaume in my mind. While Miss Labonté never made it to the NHL like Miss Rheaume, it appears she's already thinking about what she's going to do next. No, this isn't a retirement article, but I will admit that my fanboy enthusiasm took a bit of a hit today. Miss Labonté spoke with Bill Beacon of The Canadian Press, and Mr. Beacon's article was published today. It appears that the 34 year-old goalkeeper is already planning out the next stage in her life as she is returning to school to become a chef! How cool is that? Admittedly, the hockey fan in me selfishly hates this idea as I want to see Charlene Labonté play forever, but no player outside of Gordie Howe has played into his or her years of collecting a pension. The fact that Miss Labonté already has plans for what she wants to do after she finally hangs up the skates and pads is admirable, and I want to see her do just as well as a chef as she did as a hockey player. Perhaps she has a future on the Food Network? It will be interesting to see how she juggles her schedule this season. As per Mr. Beacon's article, Miss Labonté is already enrolled at the Ecole des Metiers de la Restauration et du Tourisme de Montreal, but she will still fulfill her Canadian national team duties, her CWHL duties with Les Canadiennes de Montreal, and her work one day per week as a goaltending coach at McGill University where she went to school. Miss Labonté's already-busy schedule gets a little crazier! The part of the article that ripped my heart of my chest, however, was right at the end. Labonte has yet to decide whether to play beyond this season, although she has ruled out playing in the 2018 Winter Games in South Korea. "It's tough because I still love it," she said. "But I'm not getting any younger and the young goalies are pushing on the national team. "It started last year with Emerance Maschmeyer and she was lights-out amazing. So there is competition there. The reality is that I've been there for 15 or 16 years. That's why I like to take it one year at a time and see where I'm at and analyse how I feel." With no Labonté at the 2018 Winter Olympics, I feel like a player I grew up with and idolized is already gone. There's a hole in my fandom, and it doesn't feel right. I agree with Miss Labonté in that there are a pile of amazing young Canadian goalies coming up - Maschmeyer, Genevieve Lacasse, Ann-Renée Desbiens - it was the tandem of Shannon Szabados and Charlene Labonté with whom I grew up. When you consider that Miss Labonté has earned four gold medals at the Winter Olympics plus a pile of other accolades, there's no doubt that she has had a career that most would envy. She's not done yet, but this 2018 announcement makes it feel as though the end is near despite her indicating that she's keeping an open mind about playing in the future. And let's not forget that chefs have to be in the kitchen to be able to practice their trade and continue to learn. She has already been working part-time at Les Demoiselles under chef and owner Vanessa Trahan. Trahan is a very reputable chef in the Montreal food scene, and she mentored under chef Chuck Hughes, who is a Food Network Canada celebrity and a highly-regarded chef and co-owner of Garde Manger and Le Bremner. In other words, Miss Labonté is learning from one of Montreal's best young chefs! I have no doubt that Charlene Labonté will take to cooking as well as she has taken to goaltending. She worked hard to reach the pinnacle of her sport, and I have a sense that she will give the same effort in her soon-to-be full-time chosen profession. I'll still be a fan of Canadian netminder for as long as she plays, and I applaud her for thinking about the future now as opposed to later. Her master's degree in sports psychology shows she's a smart cookie. Perhaps she'll be making delicious cookies in the future? If nothing else, Charlene Labonté has given me a reason to visit Montreal if and when she moves into the culinary world. How many times can you say you had a meal prepared for you by a four-time Olympic gold medalist? Best of luck in your culinary adventure at school this year, Charlene, and keep stopping pucks for as long as you can! The big guy wearing #2? That's Adam Pardy. Pardy was once a reliable Winnipeg Jets defenceman who, unfortunately, was waived towards the end of the season last year only to be claimed by the Edmonton Oilers. 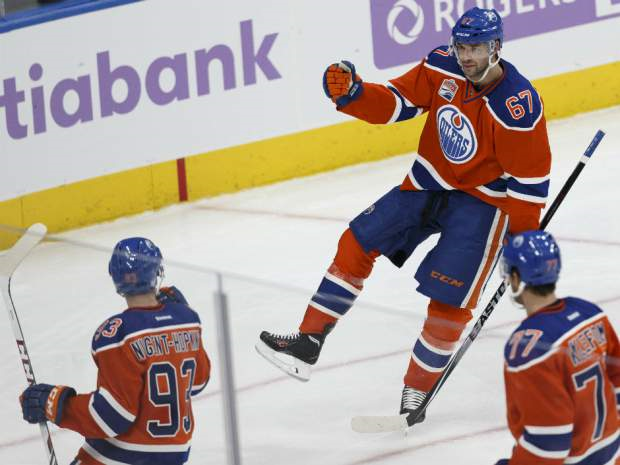 Pardy's time in Edmonton was short-lived as he hit free agency this summer, and he eventually landed in Florida with the Panthers on a professional tryout. The Panthers' blue line is considerably better this season, so Pardy began the season patrolling the blue line for the AHL's Springfield Thunderbirds after being a late cut in Florida's training camp. Today, though, Pardy is on the move as the veteran of 338 NHL games will find himself wearing double-blue once again in career! While he wore the double-blue of the Jets and IceCaps in his career, he'll instead don the double-blue of the AHL's Milwaukee Admirals as the Springfield Thunderbirds and Admirals made a deal involving the lanky defenceman. The Admirals swapped forward Eric Robinson, defenceman Teddy Doherty, and goalie Brandon Whitney for Adam Pardy, and it appears he'll be in the lineup when the Admirals visit the Iowa Wild on Friday night. A quick glance at the Admirals roster shows Pardy will wear #6 with his new club! I find this to be a bit of an odd trade as the 32-year Pardy had yet to suit up for a game in the AHL. While there's no denying Pardy's professionalism when it comes to being prepared for a game and a season, it's rare to see a trade in the AHL that doesn't show immediate benefits for both sides. For example, Springfield gets Robinson who played one game with Milwaukee after being recalled from the ECHL's Cincinnati Cyclones, Doherty who is playing with the Cyclones, and Whitney who hasn't played anywhere this season after spending all of last season in the ECHL. You might look at the players who went to Springfield as potential up-and-comers, but there's little proof of that as well. Whitney was the only one of the three who was drafted, and he went in the seventh-round at 191st-overall to the Chicago Blackhawks in 2012. His 9-8-1 record last season was buoyed by a 3.18 GAA and a .891 save percentage. Doherty was a serviceable defenceman at Boston College for four years where he posted a career-best 13 goals and 13 assists in 2015-16, but he has all of three games of experience at the ECHL level. Eric Robinson put up decent stats at Dartmouth College, but he's played just 16 AHL games and 11 ECHL games to date. If Springfield was taking a chance on unearthing some buried gems, they must have some pretty detailed scouting reports on these three players. Pardy, however, becomes the Admirals' most experienced player both in games played and age. The Admirals have a fairly solid roster, but they have an extremely young defence corps with Petter Granberg being the oldest player on the blue line at 24. The Admirals might be looking to Pardy to be the veteran leader on the back end in terms of bringing his knowledge and experience to Milwaukee. Along with Trevor Smith and Matt White, he becomes only the third Admiral born in the 1980s. I always thought that Adam Pardy was underrated in Winnipeg. By no means was he ever going to play top-line minutes, but he was often relegated to the press box until an injury hit the Jets. When he was pressed into action, he was smart and responsible with the puck. He often sacrificed his body to make a play, and he rarely ever was caught out of position. I always thought his play went unheralded despite him doing the dirty work that others may have avoided. Here's hoping Pardy can be a solid contributor to the Admirals' game plan. He won't fill a scoresheet like Erik Karlsson or Kris Letang, and he doesn't have a cannon like Shea Weber or Dustin Byfuglien. Rarely will you see him leading the rush out of the defensive zone like Mark Giordano or Drew Doughty. What you will get from him, though, is 20-some minutes of hard work, sacrifice, and effort. And those traits are exactly what he should be teaching those young guns on the Admirals' blue line. The Heritage Classic is over, and we'll now await the next outdoor game on December 31 when Toronto welcomes the world to its city for the 2017 Centennial Classic between the Maple Leafs and Detroit Red Wings at BMO Field. I have to admit that I had a blast at this event, but there were some observations that need to be made. Some of these observations may have been written on this blog already, but let's air the laundry when it comes to what I saw this weekend. SECURITY. I wrote about this the other day, but the security people hired by either the Jets or by the NHL need more than a high-end briefing on what is and isn't allowed at an NHL outdoor game. I was baffled by the stance taken on cameras when it comes to an event like this, and I find it hard to believe that the hired rent-a-cops couldn't get the rules right. This needs to be infinitely better for future events. JERSEYS ON FANS. I saw some incredible jerseys. I want to toss out some kudos to the guy wearing the WHA Alberta Oilers jersey complete with "Alberta" block name on the back. This jersey reaches back to the earliest days of the WHA in 1972 when the Alberta Oilers wore the province's name across their shoulders prior to using players' names in that spot. Kudos will be passed along to the few people wearing WHA Jets jersey. I'll also hand out kudos to the one guy who was seen wearing a Shane Doan Winnipeg Jets jersey! That one caught my attention in a big way! JERSEYS ON FANS. Look, for every incredible jersey, there was someone wearing a jersey that was less-than-incredible. I saw more "Gretzky" jerseys on the orange Edmonton alternates. I saw a "Gretzky" on a McFarlane Oilers alternate. I saw a number of "Hawerchuk" jerseys on current Jets uniforms. I saw players' nicknames on jerseys. I saw statements on jerseys where names should have been. Look, I get that you bought the jersey so you can decide to put whatever you want on it, but it looks wrong. In fact, it is wrong in most cases. This pet peeve will never die for me. SPECTATOR PLAZA. A fantastic place where a pile of things were happening, but I've never had so many people ask me where they can buy merchandise. I get that there are certain places to buy gear, but a place like Spectator Plaza is literally a gold mine for merchandise sales as people are already prepared to spend money there. When fans offer me money for the toque I was wearing, you might want to reconsider your merchandise and retail strategy. SPECTATOR PLAZA. For the vendors that were there, I have to admit there was a pile of cool stuff to do and keep fans entertained. From the bands on stage keeping the place rocking to the Molson bubble hockey game to the free coffee from Tim Hortons to the free cake and candy provided by Hershey and Reece, there was literally something for everyone. If there's a Spectator Plaza in Toronto - and by every account there will be - go and have a ball doing all the activities there! MORE INCLUSION. When the Winter Classic was in Boston, there were games from all levels of hockey played on the rink prior to and after the Winter Classic. Winnipeg could have had all sorts of games at the rink in Investors Group Field if they had wanted. There were Manitoba Moose games, University of Manitoba Bisons games, and an assortment of minor hockey games that could have played there. I'm not sure why this wasn't done, but this is something that should be offered to local teams when possible. The memories would be off the charts for everyone who participated! Besides the outcome of the game, it was still an incredible experience for me. I was even lucky enough to skate on the ice, and I have to tell you that it's surreal. Investors Group Field looked enormous from center ice, and you can literally see every corner of the stadium from the nosebleed seats to the very front row. These are the memories I'll remember, and they are irreplaceable. I do want to thank a few people for including me in the fun. I am always appreciative of my good friends Brenda B., Ryan G., and Rhonda G. for their contributions this weekend in making this an experience I'll never forget, and I cannot thank them enough. I want to thank Natalie from Reebok for an incredible experience, and Michelle from CTV Morning Live for putting up with my "superfandom". I also want to thank Jamie, Jenelle, and Brayden who worked with me at the Spectator Plaza tent where we ended up laughing more than working. It was so much fun! Get out and experience one of these events, folks. There were some bumps on the road this weekend, but the overall experience is one that will not be forgotten nor would I have traded it for anything else! With the Heritage Classic in town, I have been busier than busy with various appearances on local news and working at various events. Because of this, The Rundown is going into "stealth mode" as I literally do a two- or three-line recap for each game. It's not the usual quality that I give to CIS women's hockey, but I simply didn't have the time this weekend to do my usual setup for the games. As a one-man show, sometimes HBIC falls victim to priorities that are higher based on needs. This is one such weekend where that happened, so I apologize for those that enjoy reading about the best women hockey players at Canadian institutions of higher learning. Next weekend, we're back to normal! REGINA at MANITOBA: The Bisons continued their winning ways with a dominant 5-1 win. The Bisons got goals from Jordyn Zacharias, Charity Price, Alexandra Anderson on the power-play, Alana Serhan, and Lauryn Keen. Lilla Carpenter-Boesch snapped Rachel Dyck's shutout streak at 132:07 with her goal. Dyck 16 saves for the win while Jane Kish took the loss in allowing five goals on 30 shots in 40:19 of work. Morgan Baker made four saves on four shots in relief. REGINA at MANITOBA: The second game featured another onslaught of offence by the Bisons as they scored seven goals before Regina got on the board. Manitoba saw goals from Nicole Carswell, Venla Hovi, Erica Rieder, Taryn Kokesch, Alana Serhan on the power-play, Sheridan Oswald, and Erin Kucheravy on the power-play before Kylie Gavelin's power-play marker midway through the third period rounded out the scoring. Manitoba takes this game by a 7-1 score as we saw 11 different goal-scorers for the Bisons this weekend. Rachel Dyck was good on 24 of 25 shots while Jane Kish stopped 12 of 16 shots in 31:34 of action in taking the loss. Morgan Baker made 12 saves on the 15 shots she faced in relief. CALGARY at MOUNT ROYAL: The first game in the Crowchild Classic needed double-overtime to find a winner as the Calgary Dinos picked up the win with a 3-2 victory. The Cougars celebrated goals by Reanna Arnold and Sarah Weninger while Calgary got markers from Rachel Paul and Audrey Buston before Buston scored her second of the game 4:32 into the double-overtime period. Hayley Dowling picked up the win in making 27 saves while Emma Pincott took the loss in extra time. MOUNT ROYAL at CALGARY: The second half of this home-and-home series for the two Calgary-based schools saw the Cougars respond after a tough loss with a 2-1 road victory! The same two women as the previous night were responsible for Saturday's win as Reanna Arnold and Sarah Weninger tallied the goals for Mount Royal. Calgary's Cheyann Newman had the lone goal for the Dinos on this night. Zoe DeBeauville picked up the first Mount Royal win this season in stopping 21 of 22 shots while Hayley Dowling took the loss after making 28 stops. UBC at ALBERTA: Two first-period goals would be all that UBC needed on this night. Logan Boyd and Mathea Fischer scored for the Thunderbirds while Amelia Boughn earned her first CIS shutout as the T-Birds downed the Pandas by a 2-0 score. While UBC was outshot in this game, Alberta's Lindsey Post only stopped 16 of 18 shots in the loss. UBC at ALBERTA: The second game of the weekend set needed a fifth period for a winner. Alberta got goals from Autumn MacDougall on the power-play and Abby Benning in regulation time while UBC saw goals from Mairead Bast on the power-play and Logan Boyd. In the extra time, Logan Boyd scored 11 seconds into double-overtime to push UBC to the 3-2 win. Tory Micklash picked up the victory in stopping 18 shots while Dayna Owen suffered the loss in stopping 16 of 19 shots. SASKATCHEWAN at LETHBRIDGE: Two goals in the second period put the Huskies up for good in this game as Saskatchewan won 4-2. Lethbridge scorers included Aislinn Kooistra and Jodi Gentile while Saskatchewan was paced by goals from Courtney Cormack, Kaitlin Willoughby, Kori Herner, and a power-play marker from Shyan Elias. Jasey Rae Book picked up the win in stopping 14 of 16 shots while Alicia Anderson was on the losing end despite stopping 43 shots! SASKATCHEWAN at LETHBRIDGE: The same margin of victory led Saskatchewan to a second-straight win over the Pronghorns, but the final score would be much different. Rachel Johnson scored a power-play goal while Lauren Zary notched a shorthanded goal, and Cassidy Hendricks was perfect on 23 shots as the Huskies blanked the Pronghorns 2-0. Alicia Anderson was under siege in the Lethbridge net once again as she stopped 31 shots in a losing effort. BROCK at GUELPH: This game needed extra time to determine a winner. Guelph's Sydney Davison and Brock's Annie Berg traded goals in the second period - Berg's goal coming on the power-play - while both Valerie Lamenta and Jensen Murphy went save-for-save through 60 minutes. In double-overtime, Guelph's Karli Shell finally broke the stalemate at 2:25, and the Gryphons took the victory with a 2-1 score. Lamenta made 27 saves in the win while Murphy stopped 29 shots in the loss. TORONTO at RYERSON: The final score in this game is probably considered an upset. Kryshandra Green scored in the first period and Ailish Forfar added a second goal midway through the third period as the Ryerson Rams downed the Toronto Varsity Blues by a 2-0 score. Sydney Authier stopped all 33 shots fired at her for her first shutout of the season while Hailey Farrelly surrendered two goals on 20 shots in the loss. WINDSOR at NIPISSING: Three straight goals would pace the Lakers to the 3-1 victory over the Lancers. Taylor McManus, Bronwyn Bolduc, and Kaitlyn McManus on the power-play put Nipissing up 3-0 before Danielle Butler got one back for Windsor with two minutes to play, but it wouldn't be enough. Jacqueline Rochefort stopped 21 shots to record the victory while Morgan Farrow stopped 35 shots in a losing effort. UOIT at WATERLOO: Maryn Caragata's strike and Amy Barnard's empty-net goal were the only two pucks to find the back of the net in this game as the Waterloo Warriors downed the UOIT Ridgebacks by a 2-0 score. Stephanie Sluys was perfect on 23 attempts at the net for her first shutout of the season while Cassie Charette took the loss despite stopping 30 of 31 shots. QUEEN'S at LAURIER: Addi Halladay and Emily Jukosky scored the only goals in this game as the Queen's Gaels shutout the Laurier Golden Hawks 2-0. Stephanie Pascal stopped all 31 shots that Laurier attempted for the shutout win while Amanda Smith made 29 saves in the loss. BROCK at YORK: The Badgers came into this game looking to erase the loss suffered on Wednesday to Guelph. Three straight goals in the second period helped Brock to that goal as Christina Leradi book-ended a Lisa Buratynski goal for the 3-0 lead. The Lions got one back when Erin Locke scored with just under seven minutes to play, but they would get no more as Brock downed York 3-1. Stephanie Loukes stopped all but one of the 35 shots she saw for the win while Lauren Dubie had a rough night in stopping just 16 of 19 shots in the loss. GUELPH at TORONTO: It might be hard to believe, but Toronto scored one goal all weekend and went 1-1. Kristi Riseley scored the only goal of the game early in the second period as the Varsity Blues downed the Guelph Gryphons 1-0 in this game. Valencia Yordanov stopped all 23 shots in the shutout win while Valerie Lamenta surrendered just one goal on 23 shots and took the loss. WINDSOR at LAURENTIAN: Every time it looked like Windsor was generating momentum, Laurentian would crush that hope. Shawna Lesperance scored 33 seconds into the game for Windsor, but Laurentian wiped that out with a power-play goal and a shorthanded goal from Ellery Veerman. Krystin Lawrence would tie the game 1:33 into the second period, but Laurentian would get goals from MacAuley Carr, Maggie Brennan on the power-play, and Elissa Bertuzzi to pace the Voyageurs to the 5-2 victory. Laura Deller earned the win in making 25 saves while Molly Jenkins took the loss in making 13 of 17 stops in 30:59 of work. Morgan Farrow came on in relief of Jenkins and stopped 10 of 11 shots she faced. WESTERN at NIPISSING: The Lakers were the only team to put ink on the scoresheet in this game. Taylor Murphy scored in the first period and Bronwyn Bolduc added a power-play goal in the second period while Jacqueline Rochefort stopped all 27 shots she faced as Nipissing downed the Western Mustangs 2-0. Tareya Webster, wearing #94 in net for the Mustangs, stopped 22 shots in the loss. QUEEN'S at WATERLOO: This one was ugly. Waterloo's final score was determined off goals by Amy Barnard, Cynthia Cavanagh, Alison Hanson, Angela MacDonald, Hanson again, and Tegan Odland. When all was said and done, Stephanie Sluys had stopped all 15 shots she faced to shutout the Queen's Gaels 6-0. Stephanie Pascal stopped 10 of 14 shots in taking the loss for Queen's, but she only lasted 22:51. The remainder of the game was handled by Claire Warren who stopped 23 of 25 shots she faced. WESTERN at LAURENTIAN: The Voyageurs looked very solid this weekend as they picked up their second win in two days with a 4-2 victory over Western. Laurentian got goals from Morgan McCann, Ellery Veerman, Taylor Weber on the power-play, and Emma Leger while Western saw Alyssa Chiarello score on the power-play and Megan Taylor at even-strength in the loss. Laura Deller stopped 27 shots in the win while Katie Jacobs took the loss despite making 30 saves. RYERSON at YORK: Ryerson and York needed a skills competition to determine a winner. Ryerson goal scorers incuded Ailish Forfar and Lauren Nicholson while York got goals from Leah Hibbert and Dana Somerville. In the shootout, York's Rianna Langford and Dana Somerfield scored while Ryerson was kept off the board as York took this game 3-2. Lauren Dubie stopped 26 shots for York in the win while Sydney Authier stopped 33 shots in a losing effort. UOIT at LAURIER: Laurier's Danielle Wark opened the scoring in the first period, but UOIT's Chelsea Ball would tie the game in the second period with a power-play goal. In the third period, the Panthers got a goal from Kassidy Nauboris with 4:28 to play, and that goal would be the difference as UOIT downed Laurier by a 2-1 score. Cassie Charette made just 10 stops in the win while Laurier's Lauren Webber stopped 30 shots in the loss. McGILL at MONTREAL: The Martlets beat up on the Carabins in this one. Olivia Atkinson, Nicole Howlett on the power-play, Melodie Daoust, Jade Downie, and Sidonie Chard scored for McGill while Montreal's lone goal came off the stick of Alexandra Labelle on the power-play. After the dust had settled, McGill took the victory with a 5-1 defeat of Montreal. Tricia Dequire picked up the win with a 22-save performance while Marie-Pier Chabot took the loss despite making 32 saves. CARLETON at OTTAWA: Holy goal-scoring, Batman! Carleton got goals from Shannon Pearson, Delaney Ross, Hannah Dinovitzer, and Katia Boulianne. Ottawa, however, saw a pile of goals scored as Shanie Deschatelets, Melodie Bouchard on the power-play, Bryanna Neuwald, Marimee Godbout-Parent while shorthanded, Bouchard again on the power-play, Vickie Lemire, and Godbout-Parent on the power-play all tallied for the GeeGees. In the end, Ottawa took this game 7-4 over the Ravens. Emilie Bouchard made 24 saves in the win while Katelyn Steele stood in for all seven goals against in the loss. MONTREAL at CARLETON: The two RSEQ teams who had recorded losses on this weekend met on Sunday. The Ravens opened the scoring off Jenna Mitchell's goal, but Montreal erased it with two second-period goals from Maude Laramee and Jessica Cormier. The Ravens scored a pair of their own in the third period off the sticks of Katia Boulianne on the power-play and Tawnya Guindon, and they would skate to the 3-2 victory over the Carabins. Katelyn Steele rebounded from the loss the night before to record a 47-save win while Marie-Pier Chabot surrendered three goals on 16 shots in the loss. CONCORDIA at McGILL: Three goals were scored in this game. Sidonie Chard scored for McGill in the first period, Melodie Daoust added a second Martlets goal in the second period, and Concordia's Marie-Joelle Allard scored on the power-play to make things interesting in the third period. It wouldn't be enough, though, as McGill captured victory with the 2-1 score. Tricia Dequire picked up her second win of the weekend with the 29 stops she made while Katherine Purchase suffered the loss in stopping 22 of 24 shots. DALHOUSIE at ST. FRANCIS XAVIER: One team got all the goals. StFX saw Lisa Downey score shorthanded, Sara Bujold, Lydia Schurman, and Santana Gravelle score goals in the third period before Bujold fired a puck into the empty net while shorthanded for the 5-0 StFX win. Carley Molnar improves to 1-1-0 on the season with the 14-save shutout win while Mati Barrett drops to 0-3-0 in the loss. SAINT MARY'S at MOUNT ALLISON: One team got all the goals. Goals for the Huskies came off the sticks of Siobhan Birch, Hannah Askin, Caitlyn Manning, and Laura Polak to pace the team to a 4-0 victory over the Mounties. Rebecca Weagle, wearing #73 for Saint Mary's, stopped all 21 shots sent her way for the shutout while Keri Martin took the loss despite making 46 saves on the night. ST. THOMAS at UPEI: One team got all the goals. Lauren Legault, Lauren Henman, and Paige Jackson scored the three goals recorded on the night, and the St. Thomas Tommies took this game by a 3-0 score of the UPEI Panthers. Abby Clarke was perfect on 17 shots for the shutout win while Marie-Soleil Deschenes stopped 31 shots in the loss. MONCTON at DALHOUSIE: One team got all the goals. Both teams scored! Moncton picked up a power-play goal from Brittany Poitras and added a second goal from Karine Roy, but Dalhousie got goals from Jesse Rietveld, Elizabeth MacArthur, Lisa Maclean, and an empty-netter from Courtney Sheedy. Anytime you have an empty-net goal, you're on the winning side of the scoreboard, and the Dalhousie Tigers took this game 4-2 over the Moncton Aigles Bleues. Jessica Severeyns made 25 saves for the win while Sabrina Lebrun stopped 33 in the loss. UPEI at SAINT MARY'S: One team got all the goals. Caitlyn Manning, Hayley Hallihan, and Siobhan Birch did all the scoring and Rebecca Clark did all the stopping as the Panthers were shutout for a second-straight game as Saint Mary's won 3-0. Clark improved to 2-1-0 with the 12-save shutout win while Marie-Soleil Deschenes falls to 2-2-0 after making 29 saves. MOUNT ALLISON at ST. THOMAS: One team got all the goals. The Tommies put a thrashing on the Mounties after they got goals from Lauren Legault, Alisha Gilbert, Rahel Michielin, Emily Oleksuk, and a pair from Lauren Henman. In the end, the Tommies scored a 6-0 victory over the Mounties. Taylor Day improved to 2-0-0 with her 26-save shutout win while Keri Martin dropped to 1-3-0 on the season after surrendering five goals in 40:40. Lindsey Wray came on in relief of Martin, and she stopped 16 of 17 shots. MONCTON at ST. FRANCIS XAVIER: One team got all the goals. Both teams scored! Moncton scored a pair of power-play goals off the sticks of Janelle Graham and Marie-Pier Corriveau. StFX responded with a shorthanded Daley Oddy goal, an even-strength Daley Oddy goal, an empty-net Lydia Schurman goal at 13:36, and a second empty-net goal off the stick of Sarah Bujold. The end result is that the X-Women downed the Aigles Bleues by a 4-2 score! Carley Molnar started the game, but suffered an injury late in the first period for StFX after stopping four of five shots. Instead, Pascale Daigle moved to 1-1-0 with the win in a 22-save performance while Gabrielle Forget dropped to 1-2-0 after stopping 30 shots in a losing effort. So there you have it, folks. A quick and dirty rundown of all the games this past weekend. Next weekend, I promise a better effort as my week begins to settle down a little. I'll be traveling all week again, but I should get some time to plug a few entries in. Hold tight for those! It was an amazing day. Yes, I spent the majority of it helping people at the Reebok tent in Spectator Plaza, but the day ended with me watching the Alumni Game, seeing Teemu Selanne score a pair of goals, and skating on the same ice as the greatest collection of Edmonton Oilers and Winnipeg Jets. There was a bit of a problem that the NHL should probably address regarding its policies and the security team they employed, but I'll explain that below. Right now, it's all about the Oilers and Jets alumni, my experiences, and the fantastic end to an already-incredible day! Seeing the legends that I grew up watching on the ice again can only be described as surreal. Gretzky, Kurri, Messier, Coffey, Anderson, Tikkanen, and Lowe were the backbone of the dominant Oilers dynasty of the 1980s, and standing across from there were names like Hawerchuk, McBain, Babych, Kyte, and Steen who were the foot soldiers that Winnipeg sent out to dethrone these mighty foes. Winnipeg, however, got some help from some the stars of the 1990s such as Selanne, Olczyk, King, and Eagles as the Jets assembled a nice mix of players from the 1980s and 1990s on their roster. Whether or not that roster would be good enough to dispatch the former "glory days" Oilers on this Saturday was yet to be seen. Here's the thing, though: it didn't matter. Everyone was here to watch the legends they grew up watching in the old Smythe Division come together in celebration of what they did, of the future they helped to pave, and of the memories that came flooding back to the 38,000 people in attendance. This was about watching an all-star game that featured all our favorite players from a time when the hometown team was everything and the "evil" Oilers had to lose. Smiles were big. Laughter was had. The twinkles in each player's eyes could have lit up the stadium on their own as the players took to the ice in a roar of approval from the crowd. While there was anticipation for the biggest stars, players who were never heralded as the fastest, the most skilled, the most dependable, or, simply, the greatest were suddenly everyone's favorite players. This game was as much about the players giving more memories to the fans as it was about the fans giving their heroes one last cheer for making their childhood memories so vivid. Selanne scored. Kris King scored. Dale Hawerchuk scored. Mark Messier got one back. Mike Eagles might have scored his most memorable goal as a Jet. After 20 minutes of play, the Jet led 4-1 over the Oilers as the home team appeared to be having too much fun out on the ice. However, like their teams of the 1980s, these Oilers were not to be counted out. Craig Simpson, Mark Messier, and Craig McTavish all tallied goals in the second period to tie the game at 4-4 through 40 minutes, and it was down to one period of play to determine a winner. BJ MacDonald put the Oilers up midway through the third period, but former Jets captain and current VP of Hockey Operations Kris King went to the net and found the back of the net off a great feed from Teemu Selanne, and we were tied again at 5-5. Would we see overtime? No, we would not as Craig Simpson hauled down Teemu Selanne with 3.6 seconds to play, and the Finnish Flash sniped the game-winner through Curtis Joseph's five-hole to give the Jets alumni the 6-5 win! All your highlights are below! Professional cameras are prohibited at all events in MTS Centre unless accompanied by appropriate facility media credentials. Video cameras, audio recorders, iPads or other tablets are also prohibited unless specifically approved on an event-by-event basis. MTS Centre will not check cameras or tablets for guests at events where such items are prohibited so patrons will be required to return them to their vehicle or stored elsewhere off-site. Still (non-professional) point and shoot cameras are allowed for Winnipeg Jets hockey games and certain other specified events (the use of flash is prohibited). Cameras with detachable lenses and/or ones that do not fit in a standard pant pocket will be prohibited. Venue reserves the right to determine acceptable size or type of camera and prohibit entry at their sole discretion. Camera policies for entertainment events can vary by artist and event type, and specific restrictions are not always known in advance. If unsure of camera policy for an event, enquiries can be made by calling (204) 987-7825. I could probably accept this had this policy actually been enforced for all spectators. Instead, I took three steps inside Investors Group Field after having returned my camera to my car only to find a spectator without media credentials using his Canon camera with a clearly detachable zoom lens! What in the holy hell is going on here, TNSE? It's stuff like this that infuriates me as a fan because I miss out on giving you a picture of what the game looked like from my seat. If you read my article last week about the trip to Minneapolis/St. Paul, the Minnesota Wild had no issues with my camera, and the photos were pretty incredible to see! Get your act together, TNSE. People want to capture the memories of events like this. Outside of this one major pain in the rear, the entire day was incredible. I never would have guessed that I would see the likes of Teemu Selanne, Dale Hawerchuk, and Mark Messier score goals at my age today, but the Heritage Classic event allowed me to see my hockey idols once more, perhaps for the last time, on ice. If this is the last time I see Gretzky, Kurri, Messier, Hawerchuk, Olczyk, and Selanne on the ice in Winnipeg, I can happily say I saw the guys I watched growing up defeat one of the greatest teams of all-time! While the title of this article is the same as a Russell Crowe movie, I assure you there will be no appearances from the Mystery, Alaska star. I have spent a vast number of days on the road this month, and I finally arrive back home only to spend the next three days working outdoors at the Heritage Classic Spectator Plaza! I'm sure I'm going to be exhausted after this weekend, but I happily accepted a position in the Reebok tent where I'm sure there will be many people who visit. What will I be doing? I can only explain it - I wasn't allowed to take pictures - so I'll do my best in walking you through what the tent and plaza will offer! We'll start on the right side nearest the entrance. With Tim Hortons as the key sponsor of the Heritage Classic, there is a spot where the Canadian coffee company will hand out free warm beverages that consist of hot coffee and hot chocolate. Both have become staples of the Canadian hockey culture, so there's no surprise here on either choice that Tim Hortons is offering. It also appears that Tim Hortons will be offering up a booth where those who are collecting the Upper Deck Tim Hortons hockey cards can acquire a specially-designed album for the card set. I haven't seen said album, but they were loading boxes into the tent and they had a few out, so I assume that's what may have been happening. I also assume there is some sort of card exchange there, but I didn't have time to stop and chat with these people. They were busy, and so were we! The next tent was occupied by Fantasy Scoreboards. These scoreboards will display the game info from whichever team one selects for every game from what I understood. I get that some man-caves may require a scoreboard, but isn't that why you watch the game? Anyway, they had scoreboards for a number of teams and it appears they know their stuff when it comes to their products. They have a slick presentation. The Reebok tent is up next, and it's where I am spending the weekend. There's a cool opportunity for fans to have the Heritage Classic clothing and jerseys superimposed over their own clothes for a photo, and then that photo can be texted to a cell phone! It takes some maneuvering to get the superimposed clothing just right, but it actually looks pretty cool when everything "fits" properly. There's also a cool virtual hockey game where one can partake in a skills competition or two players can play an air hockey game using real sticks! How cool is that? We didn't get to play much today, but this appears to be one of the more high-tech booths at Spectator Plaza. Honda has a pile of stuff to do in the next tent, and they appear to be giving away all the goods as well. They were hauling in bags and sunglasses and other assorted boxes of stuff, so it appears that there's a chance to win something with their target practice game. Needless to say, you're probably going to want to get your free gear from Honda if you stop by their tent. At the end of the row is the Rogers Fan Hub where there's a pile of Rogers-based stuff to do. You can have your face on a magazine, you can get a virtual autograph, and there's a virtual reality setup. It's a pretty solid assortment of things to do, and it's warm inside the trailer if it happens to get cold! That's always a bonus! As one turns the corner, there's the main stage where Sum 41 will play on Sunday. It appears that there's enough room for a good crowd to gather in front of the stage, so there could be a heckuva lot of people watching the band play this weekend. They were testing the video screens by running a top-20 outdoor game moments as well, and there's some great images and history in that video compilation! Past the beverage vendor is the Molson Canadian bubble hockey station. It is literally a bubble that one can enter and play some two-on-two hockey inside! How cool is that? The guys setting it up appeared to be using it more as protection from the rain, but the idea of playing inside the bubble in a two-on-two game sounds like a blast! Next to the bubble hockey game were the food trucks. Nothing special here: chicken wings, wraps, poutine, and beer. In other words, standard Canadian hockey food when it comes to watching the game with friends! The Winnipeg Jets had a little stand at the end of the middle row with various facts about the Jets to which kids could compare themselves. There was a 6'6" Blake Wheeler height chart, Dustin Byfuglien's death grip, and Mark Scheifele's sprint or something to those effects. It appears that the Jets will be looking for their next diamond in the rough with these challenges! On the left side, Scotiabank had a pretty awesome igloo set up where one could get a 360° image of some sort. They weren't allowing anyone inside, so I assume this is some sort of new-fangled technology. Or simply a panoramic setup of cameras. Either way, the Scotiabank igloo is something I want to check out at some point this weekend. Hershey brought out a ton of Reese peanut butter cups, but they weren't being given away. Instead, there appeared to be Reese cake - chocolate cake with icing and Reese's Pieces on top - and the new Reese's snack mix. Honestly, the sweet and savory snack was good! Reese mini peanut butter cups with peanuts and pretzel pieces? Yeah, that's good eats. I'm gonna partake in more of those this weekend. And last, but certainly not least, there was a ball hockey rink set up that used the rules of pond hockey. It appeared that multiple people could play at the same time, and there were a pair of rinks ready to go. I'm not sure I'll get in there, but there will most likely be street hockey games happening all weekend long! The NHL Alumni Game goes tomorrow while the Heritage Classic game goes Sunday. I'll have more updates as the weekend progresses! I am going to the Alumni Game, so expect a full recap about the legends playing in the game! If you're in Winnipeg for the game, stop by the Reebok tent and say hi! I'll be there all weekend as well!